That a beautiful boat. You never cease to amaze me with your craftsmanship. Last edited by mtpocket on Wed Jul 26, 2006 9:10 pm, edited 1 time in total. Very nice job! I am also a little biased toward the Prospector design. 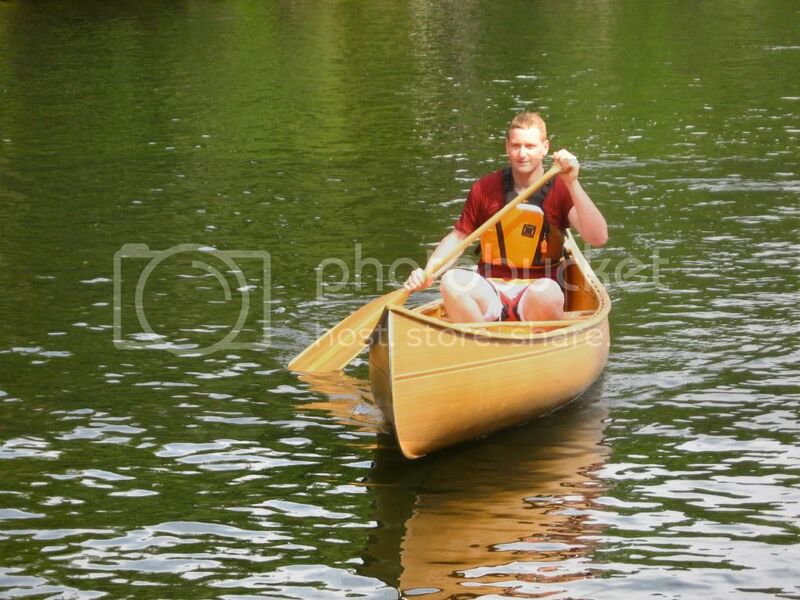 I've been enjoying all of the projects displayed on this forum, and it has certainly confirmed my choice of building the Prospector as my first canoe. Beautiful balanced lines, superior load carrying capacity, handling,and a rich history combine to make this a great project. I started last summer to clear out the garage to make space. 3 trips to the dump and a yard sale took care of most of what was occupying the future shop, then I collected most of the tools I needed and officially started building the mold In October '06. I visited Ted at Bear Mountain and found him very approachable, and eager to help with all of my questions. We even got a sneak peek at the motor launch he is building, in a word.............spectacular! Anyway, I will post a series of progress photos as soon as I figure out how to create the link in Photobucket. Here is the link to the progress photos. My name is Rob, and i'm from the Netherlands. In search for epoxy resins and ways to repair my polyester boat i came across several websites describing the build of strip-build canoes/kayaks. I got fascinated by the beauty of them, so in december 2007 i made the descision to build one myself. I got myself the latest revision of Ted Moores canoecraft and started lofting the plans for the Prospector. Now i'm at the stage of attaching the first strips, so the molds are set up and plump, the stems are bend (not beveled yet) and all my strips are sawn, bead/coved and sorted by color. But now i'm a bit puzzled how to place the first strip. I noticed that some builders, like John Caldeira let the strip follow the sheerline completely, so no fill-in strips are needed at bow and stern. Others let the first strip follow the sheerline at stations #0 up to # 3 or #4 and then let in hang of their natural curve. Can somebody help me which way is best, or can advise me on the pro's and cons ? I'm planning to use 4 or 5 lighter colored strips at first , then i'd like to use darker color for about 6 to 8 strips and then the rest to the football light again (sometimes intervened by accent strips in a different color). I'm also building a webpage, covering the process, and as soon as i have the site up and running i'll link it to the forum. any suggestions on the first strip are welcome, thanks in advance. Hello Rob and welcome aboard. I suggest you start by setting up the first strip so it just hangs down naturally at the ends. Then step back and see if you like the look. You can also try it following the sheerline to see if you like that better. Or perhaps you would prefer to have it level from end to end. 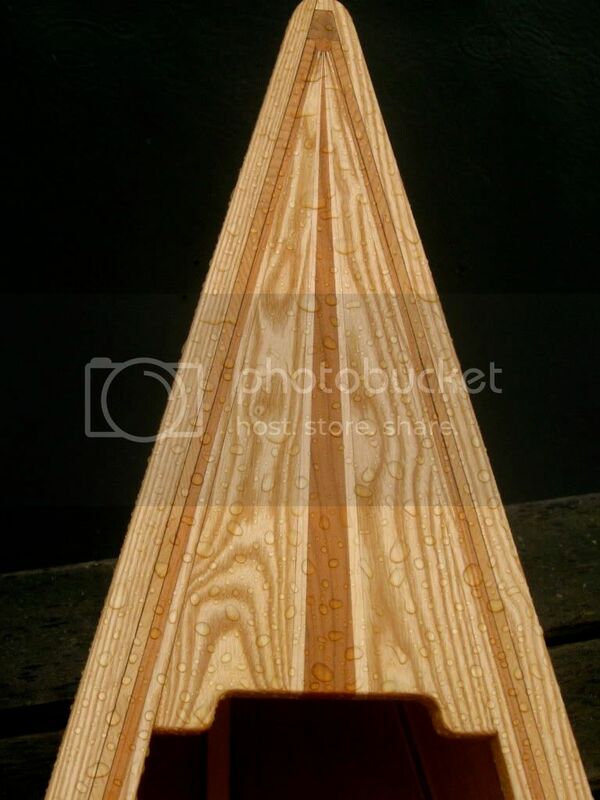 It is a matter of personal preference but usually, if the ends of the canoe are high, following the sheerline will make it look like a banana. I decided to start by setting up the first strip so it just hangs down naturally at the ends. But at the moment i'm not building at all, busy painting our polyester boat now, so i'll have a delay for about a week or 4.
i'll post my progress as soon as i start building again. 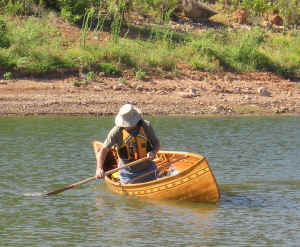 I have bought the Canoecraft book and a set of plans from this site and decided to build Prospector canoe. The choice was based on the fact that I want a canoe that is good for familly, since I have 2 small children, and want to introduce them to canoeing. 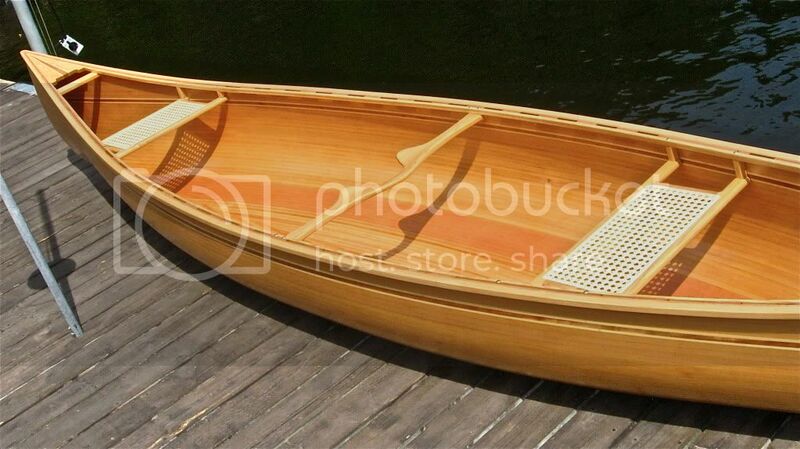 I also wanted a canoe that I can paddle myself, when I get a lucky break and a chance to spend the day on the water by myself. So the Prospector seemed a perfect answer, at least on paper. And I also liked the looks of it . The first problem was finding the wood. Because of very limited availability of WRC in our country and very high price (around 1.500,00 EUR + VAT per m3), I decided to go with local spruce (500,00 EUR + VAT per m3). The longest I could find that was the quality that I needed was 4m long and 4cm thick boards, so that was the start.Not ideal but it is a start!.